Designing a bedroom for a male no matter what their ages are can be difficult sometimes but don’t worry, we’re here to help you out on this. These ideas are great for males of all ages as there are several different styles here so get ready to be inspired and revamp that bedroom. For the little sailor in your house, this nautical themed room for a little boy is just perfect and he doesn’t even have to deal with seasickness. Decked out in a soothing blue on the walls and an awesome boat-shaped bed, it looks simply gorgeous and the room colour can even be recycled when your boy gets older. He’ll love this room with all its ship-like accents too. It may be a cliche that boys love cars and for some of them, this love starts at a young age. If you have a kid that loves cars, then this room would be awesome for them as they get to sleep in a unique car-shaped bed complete with wheels that will surely delight them. The diesel pump is another cool touch as well! As your boy grows older, he would want a more subdued design to reflect his age and those days of having his favourite toys out on display are over. Get a more modern and contemporary style for his bedroom with this classically striped walls which can last him for ages. Enter the era of teenage angst when your boy starts to go through puberty so this is when he wants his room to reflect his developing masculinity. This red and grey themed room is rugged and cool, with some antlers on the wall as decoration and a camo pattern headboard for that extra edginess. 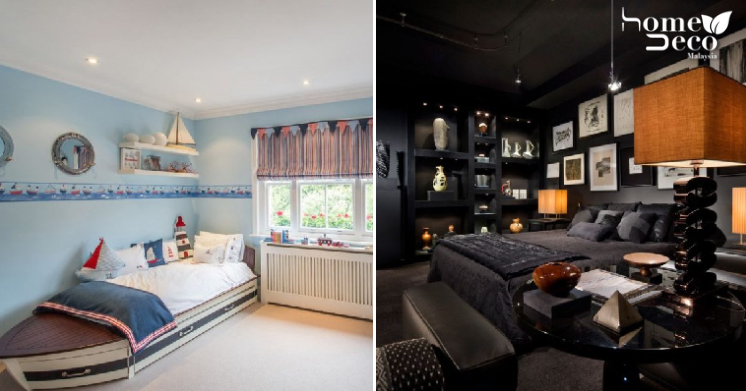 Black is a very classic colour that can never go wrong and this ultimate bedroom is so manly, you can probably feel your testosterone levels shoot up ask soon as you enter the room. It is decorated using shades of black that looks really stylish and different textures come into play here for a more luxurious feel. Usually, as a man grows older, he can’t really be bothered to decorate much in his bedroom and comfort is key here. Although this room looks simple, there are a few key details here that make it stand out, such as the fluffy throw pillows on the bed, the piece of wall art above the bed and last but not least, the bedstead that looks like it’s a rocking bed but actually stays flat.